Gregory XVII ("Siri"), in 1967 in the front left corner of picture, is shown to be visibly angry at the imposter Montini, while all the others around him (Pope Gregory XVII) generously applaud the usurper Antipope Paul VI. 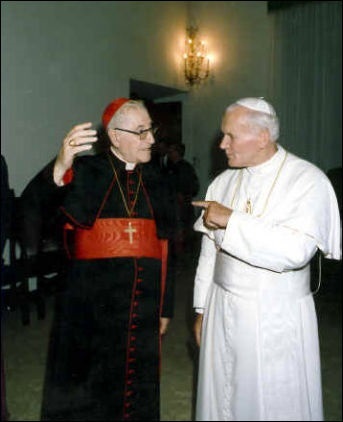 The True Pope Gregory XVII, "Siri", although always under surveillance by his masonic captors, is shown openly confronting the False pope, Karol Wojtyla. heretics of every kind came into the city of Rome. ... I saw a great darkness... ."
Pope Gregory XVII on Antipope John XXIII: "It will take forty years to undo the harm John did to the church in a few years." Pope Gregory XVII on Antipope Paul VI: He summarized the Council Vatican II of Antipope Paul VI as having issued fallible documents: "They will never bind us." Pope Gregory XVII on Antipope John Paul I: In 1978 "Cardinal Siri" was interviewed by a newspaper reporter who asked him if he liked the speech of (Antipope) John Paul I and he told the reporter that (Antipope) John Paul I didn't write it, it was prepared FOR him and he "just read it". When pushed by the reporter about how he liked the new pope or the new situation in Rome, he, rather frustrated, blurted out "it's like the papacy of *Eugene I!" *Making reference to a 7th c., Antipope! - who, when the real Pope (Martin I) was under duress, exiled in a dungeon and thinking he (Martin I) was going to die (the REAL Pope) Martin I "recognized" as legitimate an Antipope (Eugene I). Note: "Eugene I" was created in an emergency by the clergy of Rome, as Martin I seemingly could not be reached. Yet he (Eugene I) was an unlawful "pope" (an Antipope) as the eminent papal historian, Artaud de Montor explains Martin I could not have given up the See of Peter validly so long as he remained under duress.